Key West, Florida is still as colorful as ever. Despite all the recent efforts to make it mainstream and family-friendly, it still tugs at our inner pirate and pulls us in with its fiery sunsets, raucous bars, and lively good times. After I leave, I can’t wait to get back. You've gotta love a place like the Conch Republic who "seceded where others failed" from the Union in the early 80's in an act of protest against the government, something that still leaves a lasting impression about the folks (conchs) who call it home. Then there are the colorful salty characters and the Key West chickens running around everywhere. It's quirky to say the least, and a perfect destination for a laid-back and adventurous traveler. Mostly, Key West is a state of mind as much as a place - and better experienced firsthand at least once in your lifetime. And when that happens, it'll become twice, and then again, until many of you will keep coming back again and again. So if this is your first time to Key West, this First Timers Guide to Key West is for you, with ideas on what to do, when to go, where to eat and drink -- all the places you should hit up as a tourist and some hidden gems as well! We last visited Key West the week after Hurricane Irma blew through (the largest hurricane in recent decades that covered the entire peninsula of Florida from coast to coast, Sept 2017) when unbeknownst to me, my husband had arranged a romantic getaway (what a guy!) to celebrate our 30th wedding anniversary and renew our vows on Smathers Beach - just us, an officiant, and dozens of our new best friends/sunbathers as our witnesses. I still can't believe he kept his cool (and his secret) the two weeks prior as Key West and our home in Naples took a direct hit from the storm. We weren't sure what to expect when we arrived, but it was intact a week later, picking up debris, and ready to get back to normal. Key West was the perfect place to renew our vows and celebrate love in the wake of a hurricane, and it's a great place for just about any kind of laid-back vacation. What's the Best Way to Get to Key West? The easiest way to get to Key West is by plane. Many commercial carriers have connections to Key West and the city airport is modern. Plenty of taxis wait outside the terminal so getting to your hotel is easy and inexpensive. If you have the time and desire you can drive. Key West is 165 miles from Miami on US1, about 3 hours and 45 minutes on a good day. But be warned - traffic can be downright brutal and 3 hours can easily turn into twice that. For me, the sign that we’re getting close is crossing the 7 mile bridge. The water looks bluer, the sun looks brighter, and the lower keys are gorgeous. First Timers TIP: If you have the time, we recommend driving to Key West (at least once) so you may as well do it now. If you're flying into south Florida, you'll save money by flying into the hub of Miami. Book a one way car rental from Miami and fly back home from Key West. Parking in Key West can also be a headache especially if you’re staying in Old Town - another thing to consider when driving. It’s an understatement to say there’s limited on-street parking. Some hotels have a few spaces or a small lot but that’s about it. A car proves to be of little use once on the island. We've always found that walking or renting bikes for a few days gets us anywhere we want to go without having to deal with the frustration of parking. The Key West Express ferry from Fort Myers to Key West is a good alternative if you live in or are visiting southwest Florida (Naples or Fort Myers). It departs regularly from Fort Myers Beach and also from Marco Island a bit less frequently, and will get you to Key West in around 3 hours. The boat docks in the Key West Bight Historic Waterfront, where it’s an easy walk to most lodging at this end of the island. If you don’t want to walk in the heat or if you have heavy luggage, taxis are readily available. This post may contain affiliate links which may earn us a small commission at no cost to you, should you make a qualifying purchase. One of the things that makes Key West special is the variety of accommodations from inclusive luxury resorts to charming conch houses turned boutique hotels in Old Town (my favorite). There are also some cheap hotels in Key West, but I wouldn't recommend staying there. Hotels in Old Town Key West are pricey depending on the time of year and proximity to Duval Street. So if you’re traveling in the high season and want to keep the price down, consider staying several streets off Duval in either direction and closer to the Southernmost Point where it's a bit quieter. So if you're looking for the best places to stay in Key West, you'll get lots of good opinions, but we love the charm and character of the smaller conch house B&Bs in Old Town, and you won't sacrifice luxury or amenities either. Simonton Court - This place is so charming with its stately Victorian house overlooking the tropical pool, and restored cigar cottages adjacent to the house. So Key West! Check rates and more details. Marrero's Guest Mansion - These comfy and coastal-inspired rooms are in a perfect location - on Fleming Street close to Duval and other great attractions. Check rates and more details. The Marquesa - This luxury boutique brand does it right with their various properties that are just blocks from the action but off Duval on quieter streets. Check rates and availability. Heron House - This charming boutique hotel on Simonton Street has a cozy, secluded feel surrounded by gardens and foliage. Most rooms overlook the pool, some with cute balconies. Check rates and details. The Southernmost House Hotel - This gorgeous historic mansion and beachfront hotel sits at the lower end of Duval in the quieter end of town, but they definitely have their own brand of fun going on throughout the day. Check rates and availability. Sunset Key Cottages - If you're looking for a unique luxury property, the Sunset Key Cottages are the tiny gems you see across from Mallory Square during sunset. Located on it's own private island, these cottages are pricey but offer an unparalleled experience. Check availability and more details. There are so many things to do in Key West that everyone will love, especially for young families. Redevelopment in the past 10 years has made the upper end of Duval Street super family friendly. If you want to escape the family atmosphere, head to lower Duval toward the Southernmost Point for more Key West local hangouts. Take the Old Town Trolley Tour and see Key West from an open air trolley ride. This guided 12 stop hop-on hop-off tour covers the entire city. Don’t miss the Key West Butterfly Conservancy on the southern part of Duval Street for an interesting look at the local flora and fauna of the Florida Keys. Plus, good photo ops too! Head to the Key West Custom House near Mallory Square and snap a pic of the latest artwork in front. These works of art by American artist Seward Johnson change from time to time - the latest addition was the large sculpture in front of the Custom House called “Embrace Peace”. The Mel Fisher Museum is touristy but worth a visit to see what’s lying in the waters off the Florida Keys. Visit the Key West Shipwreck Treasures Museum. It holds 2 floors of genuine artifacts recovered from shipwrecks throughout the Florida Keys. Buy your Shipwreck Museum tickets! A visit to the Southernmost Point in the USA giant red buoy is a must to get your picture taken and wave to Cuba since you're just 90 miles away. The Key West Cemetery is a favorite where the headstone epitaphs are as colorful as the souls who lie beneath them - there are several funny ones to look for, but my favorite is “I Told You I Was Sick”! Literary and history fans will love visiting the Hemingway House to see how Ernest and his wife lived when they were residents. Insider Hemingway TIP: If you love everything Ernest Hemingway, a visit to Blue Heaven restaurant on Thomas Street is a must. Enjoy a slice of their huge Key Lime pie at the site where Ernest refereed boxing matches when it was the Blue Goose arena. From here, you're not too far from the Key West Lighthouse and nearby Bahama Village - fun must-sees that put you in a lesser visited neighborhood. Sunset! No matter what your daytime activities head to the Mallory Square sunset celebration to say goodbye to the day. It’s a party with food vendors, artisans, musicians and acrobats. It goes without saying that the most colorful time of day in the Keys is often at sunset - the Keys are famous for them. No two are ever the same, and they all deliver the same dazzling evening performance, which is why it's customary to celebrate the sunset. It's a daily Rite of Passage! If getting on or in the water is for you, you’re in the right place. For a really different experience and bird’s eye view of Key West, you have to go parasailing - one of the best experiences! Saltwater anglers will love the sport fishing in the Florida Keys, and there are plenty of good guides to take you out for a day. There are endless fun water activities for adults and kids alike - like diving, dolphin watches, boat rentals, and this fun 2-stop reef snorkeling trip. But it wouldn't be paradise without a snorkeling catamaran cruise or a beautiful and relaxing Key West Sunset Sail on Schooner America, a popular tour that always sells out quickly! To really get into the Key West vibe we especially love this Key West Champagne Sunset Cruise — a perfect way to celebrate Key West-style. There’s plenty of shopping on and just off Duval Street ranging from t-shirt shops, boutiques, high end brands, and artisan galleries. There are quaint shops and eating places on the side streets around Mallory Square. For unique artisan shopping, head further down Duval toward the Southernmost Point and off the side streets and visit the many artisan galleries. As a photographer, I love stopping by the Alan S. Maltz Gallery to pick up a small visual souvenir. He's one of Key West's most well-known photographers. Most of the beaches in the Florida Keys don't occur naturally - they're augmented with sand to make them more comfortable, like the beaches of Naples, Ft. Myers Beach or the shelling beaches of Sanibel and Captiva islands. That's because the Keys are mangroves, clusters of living islands that were established by spreading root systems. But in recent years, Key West has gone to great lengths to make their beaches more beautiful and user-friendly, and there are several great beach destinations to relax on for the day. So if a day in the sun is what you crave, head for Smathers Beach or Higgs Beach, Key West's popular beaches at the southernmost point of the island. White sand and food trucks along the street make for a perfectly lazy day. Be sure to pack along plenty of sunscreen and a good pair of sunglasses. Schooner Wharf (off Duval) - stay for their live music and good conch fritters! There are so many great places to enjoy the flavors of Key West - from hole-in-the-wall restaurants to upscale, cutting-edge cuisine. Key West is one of the top food destinations in the USA, because of both the seafood and Cuban influence. Here are our favorites! Pepe’s, one of our favorite breakfast places, has arguably the best breakfast in Key West. It's also my pick for the best Key Lime Pie in Key West (but of course our research is ongoing)! Louie’s Backyard - a Key West classic and still going strong. Breakfasts are great, and so is just about everything else. 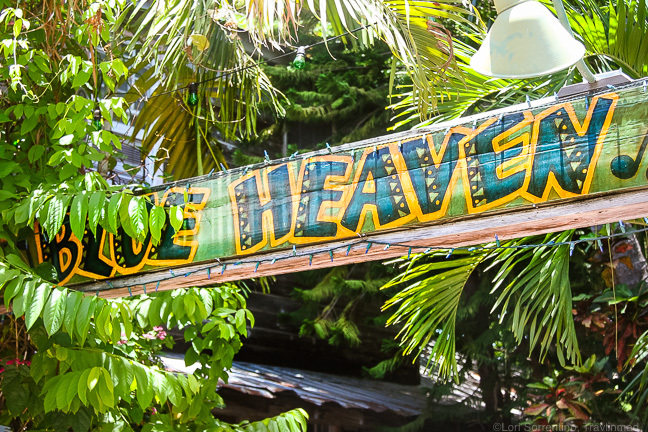 Blue Heaven - Parrotheads around the world flock to Blue Heaven, but even the sometimes crushing affect of Jimmy Buffett tourism hasn't lessoned the loveliness of Blue Heaven. The food is still good, the atmosphere is fun, and the live music is a fun way to spend an afternoon. First Flight Island Restaurant & Brewery - Formerly the Birthplace of Pan-American Airlines, is now a cool setting with good food and very good beers. Try their homemade sangria! Louie's Backyard - Louie's has been a favorite Key West eatery for decades, and has one of the prettiest settings on the island. But it's popular so make reservations! Latitude's is a great place for a special dinner and amazing sunset views you can't beat. Nine One Five restaurant on lower Duval has an imaginative menu and well presented cocktails that we really enjoyed. Caroline’s Cafe - Not only is the food good at Caroline's but it's in the center of the action so the people watching along Duval Street is great. Great key lime pie too! El Meson De Pepe - for good Cuban food and a fun, lively atmosphere just steps from Mallory Square, this is the place. Sarabeth's Key West - this restored church on Simonton Street turned yummy breakfast place is a favorite for comforting breakfasts after a hard night of partying. Santiago's Bodega - one of the best for Latin-inspired food and tapas. El Siboney - This mostly local joint serves up some of the best authentic Cuban fare we've had in Key West. The Green Parrot - The Duval Street bars are fun but touristy. If you're looking for a local's bar (although the secret has long been out) go to the Green Parrot. There's just enough crustiness left in Key West and some of it is still here! BO's Fish Wagon is a local joint hidden in plain sight near the waterfront, and it has one of the best fish sandwiches in all of Key West, still. It's touristy but First Timers are sometimes reluctant to go in because it doesn't look much from the outside. Trust us and go! Wyland's Whaling Wall - The famous Whaling Wall in Key West, one of many throughout the Florida Keys and the world, was painted by marine life artist Wyland to promote ocean conservation. Follow your own Wyland tour and check out some of the most colorful art in the Keys! 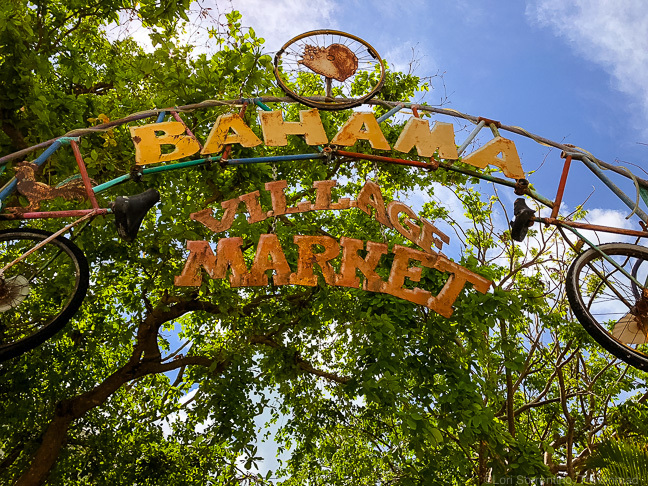 Bahama Village is a local neighborhood with funky shops, galleries, and some good bars. It's full of fun street art depicting Key West's earliest local residents. 801 Cabaret - If you're open-minded, don't easily blush, and support the LGBTQ community (and I'm not sure why you'd be in Key West if you don't) the 801 Cabaret is a good time for light-hearted and good-natured raunchiness. These ladies could give me a lesson or two on how to up my make-up routine! What's the Weather Like in Key West? Key West is closer to Cuba than it is to mainland US, so it's lovely in the winter and friggin’ hot in the summer! On bright clear days in the summer, the sun looks white and booming thunderstorms and torrential downpours occasionally send everyone running for cover. But your best deals will be in the summer, or non-peak times of year, and summer can be a great time to go. Stay in the shade or around the pool during the hottest times of day. During summer storms, experienced visitors just duck into a favorite watering hole and listen to some live music with a cold one in hand. Hot and balmy or dark and stormy, doesn’t matter, there’s always someplace fun nearby. We’ve even been there when several inches of rain washed through the front door of the bar and under our bar stools. There are far worse things than a little rain. You're on island time! What's the Best Time to Visit Key West? Winter months of December through March are the most crowded and priciest time to visit - hurricane season is over and the temperature and humidity become more moderate. If you’re willing to gamble you can get great deals during hurricane season, officially June 1 through November 30 with August through October being the most likely months for activity here. Spending New Years Eve in Key West is seriously one of the most fun things you could do in your lifetime. Make hotel reservations at least 6 months ahead of time. At midnight, watch the giant clam shell drop at the Half Shell Raw Bar, the Pirate Wench lowered from a tall ship mast at Schooner Warf, or Sushi being lowered into the bubbling champagne shoe at Bourbon Street Pub on Duval Street. Summer - June-August - brings the rainy season with high temperatures and humidity but there are fewer crowds, hotel rates are at their lowest, and the lines at the best restaurants are shorter. We don’t mind the heat and have always found this to be a great time of year to visit. March through May offers the best balance of temperatures, humidity, and rain. It’s a good time to visit as rates are good and tourism is moderate. Just be sure to check the festival calendar. In recent years, the number of festivals has gone insane and you may want to be a part of the action or wait until it’s over. We love Key West. In fact, I've never met a person who doesn't. Without a doubt, Key West should be on everyone's USA Bucket List. Is it on yours? If you only go with a swimsuit and one other thing, make it good sunglasses - they are a must in the Keys and all of Florida! The white intensity of the sun is different than you may be used to in other parts of the US and the world. Protect yourself from eye strain and headaches and bring polarized sunglasses with UV blocking glass.